is this program approved by a Rav? are her teachings accurate? Rav Alona is no charge, why would her program be worth all that money? just asking....thanks. Please direct those questions to Shifra, I can't answer them. I understand that the price is prohibitive for many people, nevertheless there are some who will want to be part of this. are you taking commission from this Devorah? No I don't make any money from this blog, unless it is by way of a donation. If anyone desperately wants to be part of this but cannot afford the price, I suggest you email Shifra and introduce yourself and ask for a discount. At this point, that's all I can recommend you to do. There is a free introductory audio recorded by Shifra, which can be accessed by everyone. Here’s the link where you can sign up for free to listen to it. Hi, this is Shifra, just popping in to answer these questions. First, Devorah heard about the program and really wanted to share it with her readers, because, in her words, "we are obsessed with geula." So am I. I've been obsessed with geula since the Lubavitcher Rebbe told us in 1991 that "Moshiach is ready to come now. I have done everything I can and now, all I can do is give it over to you - do everything you can, and in a way of orot d'tohu in keilim d'tikkun... May it be G-d's will that there will be found 10 people among you of am kashei aretz who will not give up... maybe it be G-d's will that there will be 1 or 2 or 3 who know what needs to be done and how it should be done." Regarding paying tuition when so much Torah is out there for free... I totally get it. However, this is not another shiur. Although it's text-based, it is a different kind of learning. Combined with profound prayer, deep connection, meditations and some very powerful transformational tools, it will create continuous expansions in consciousness and eventually far more ability to influence reality (i.e. experience actual miracles occuring in your life.) Most important - YOU WILL ACTUAL FEEL THAT HASHEM IS PRESENT WITH YOU. This is already happening in my Jerusalem class as well as previous online programs. I'm charging tuition both because this is my parnossa (I am not just a teacher but a highly experienced lifecoach and personal mentor) and because it is very important for people who actually want to transform their lives to have some skin in the game. This program is definitely NOT for everyone. But if it's for you, and you commit and do the work, it will absolutely transform your life. Here's a link to a free intro I'm doing on Monday, 7 pm Israel time/12 pm eastern. It will be recorded, so if you think you might be interested in exploring further, feel free to register at the link below. How do I find out about your Jerusalem classes? Eli - Shifra may not see your comment. 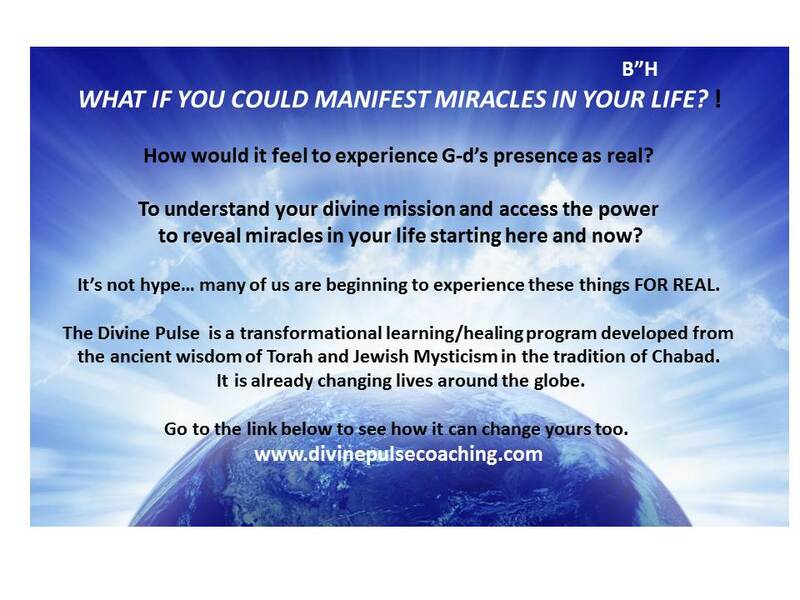 Go to http://www.divinepulseprogram.com/ and at the bottom of the page you'll see an email link, use that to contact Shifra.